One of the primary control measures for malaria is indoor residual spraying (IRS). Historically, few women have been employed in IRS programs. The President’s Malaria Initiative (PMI) VectorLink Project implements the largest IRS project globally and protects millions of people from malaria across Africa. The project’s work benefits pregnant women and children, as they are most vulnerable to contracting malaria. 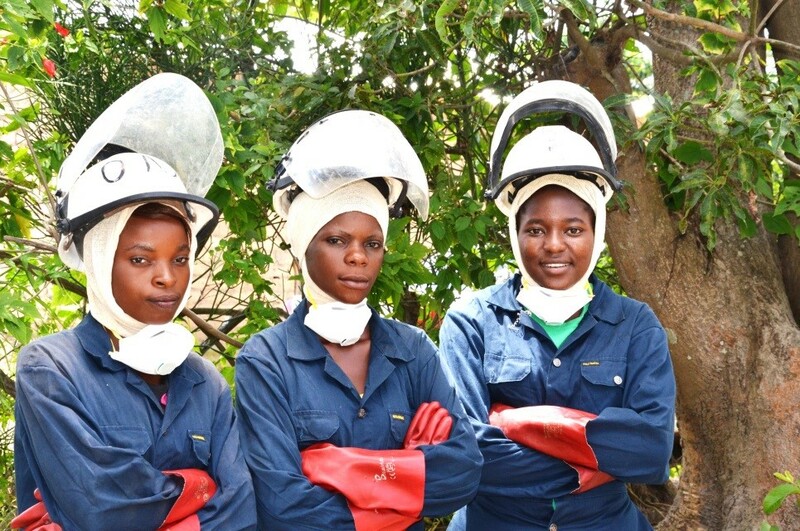 In addition, the project actively promotes gender equality and female empowerment at all levels of its operations. PMI VectorLink works with key stakeholders to identify barriers to women’s participation in IRS and implements a series of operational policies to address these barriers. Using routine programmatic data, the project actively monitors and reports against gender-related goals. Results show that including women more fully in IRS results in improved vector control outcomes while also advancing women’s economic empowerment. To attract and retain female employees, the PMI VectorLink Project adapted the physical work environment to ensure privacy for women. PMI VectorLink ensures that every operational site has separate changing areas, separate bathrooms with trashcans, and separate shower areas for men and women as spray operators must change and shower after spraying to minimize the risk of insecticide contamination. To further enhance privacy, the women’s showers are designed with walls that reach the ground and are high enough to ensure complete privacy. Showers have proper drainage so that others cannot see the residual water, which women requested due to sensitivity around menstruation. Spray campaigns do not begin unless operational sites are verified as meeting these and other environmental compliance standards. Sexual harassment is not tolerated, and all workers, both temporary and full-time staff, can anonymously report any misconduct. Sexual harassment guidelines, with a phone number to call to report any misconduct, are posted in a local language at each operational site. The project has incorporated gender and sexual harassment content into trainings given to government partners, supervisors, and seasonal employees. To accommodate traditional norms that might prevent women from working all day alone with men to whom they are not related, the project instituted a buddy system for female spray operators. If there are women on a spray team, there must be at least two women on the team. The PMI VectorLink Project is committed to providing jobs to qualified staff, regardless of their gender. With spray campaigns happening annually in many of the project’s countries, work on PMI VectorLink can provide opportunities for professional growth as returning workers take on increasing levels of responsibility. The project is working with the National Malaria Control Program (NMCP) in each country to recruit and hire more women, ensuring a sustainable approach to gender-integrated IRS after the project ends. Exposure to insecticides for IRS is not safe for pregnant or lactating women. The PMI VectorLink Project is committed to upholding safety standards, while also attracting and retaining female talent. All female seasonal workers take a pregnancy test every 30 days during the spray campaign. Results are delivered in private. Any woman who has signed a contract and then is found pregnant is guaranteed a position on the Project at her initial wages. Depending on her role, the teams find other positions, such as data verification assistants or mobilizers, for the pregnant worker. The objective is to retain and promote qualified women, while allowing professional growth and income generation during a pregnancy. The project focuses on identifying women with potential for supervisory positions. These women receive mentorship and training and many return to work as team leaders or supervisors in the following year. The PMI VectorLink Project uses a mobile banking system for its seasonal workers, providing risk-free, safe and reliable payments. Facilitated by a mobile network operator, seasonal workers are able to access their money through a mobile phone SIM card. Mobile payments are helping to increase financial options and decision-making authority for workers, particularly women. With direct access to electronic funds, women now have more control over their money, allowing for independent financial planning, saving, and purchasing as the recipients can use the phones to manage their financial accounts including money deposits, transfers, and cash out.